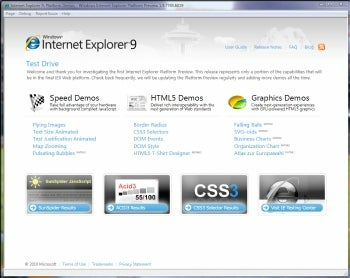 Microsoft today released a "platform preview" of Internet Explorer 9. This isn't an IE9 beta, mind you; it doesn't have the features you'd expect in a browser. It doesn't even have an address bar for that matter. Instead, the IE9 Platform Preview serves as a sneak peek at some of the new Web technologies and standards that Microsoft is working on building into its flagship browser.